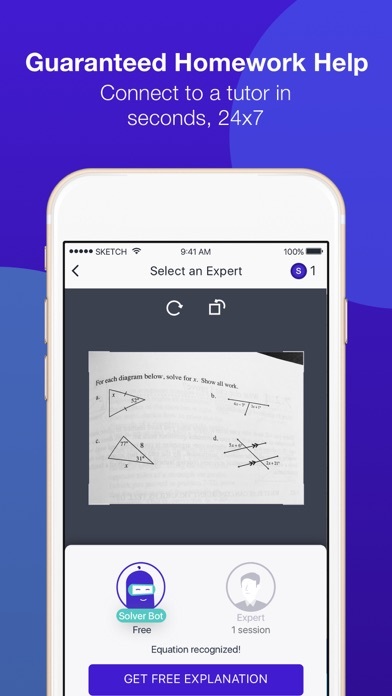 Stuck on a homework problem or studying for a test and need help right away? We’re the ONLY app that guarantees you Math, Physics and Chemistry help when you need it – 24×7, anytime, anywhere. We make it easy for you to get study help so you can have more free time, less stress, and get better grades! 1. Snap a pic of your Algebra, Geometry, Trig, Calculus, Physics, Chemistry, ACT or SAT Math homework problem. 2. 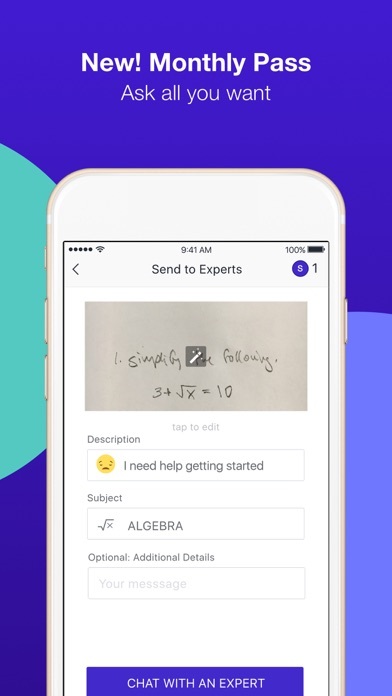 Connect to a Study Expert tutor in seconds for a personalized, 10-minute chat session. Our live Study Experts help you solve even the hardest types of problems, including diagrams or complex equations. Need more time with your Study Expert? Get another 10 minutes of tutoring for free — just ask your Study Expert before your chat session ends. 3. Access your complete tutoring chat session history whenever you need a quick review. Our live Study Expert tutors go through a rigorous training and qualification process to become a Got It Study Expert tutor. They care about tutoring and teaching you how to solve your problem until you fully understand what you’re learning. Once they become a Study Expert, they are continuously audited to ensure they continue to deliver the highest level of tutoring. Our Study Experts all have college degrees in Math or Science and come from different occupations – from a teacher to an engineer to product manager and more. We guarantee you’ll get the right solution! High school, college university, community college and homeschooled students get better grades with PhotoStudy. No upfront or inconvenient scheduling is required, just ask a question and you’ll be instantly connected to one of our Study Experts! Don’t have a question, but need help learning a new topic covered in school? PhotoStudy Academy has over 750 lessons that cover ANY Math, Physics and Chemistry topic! 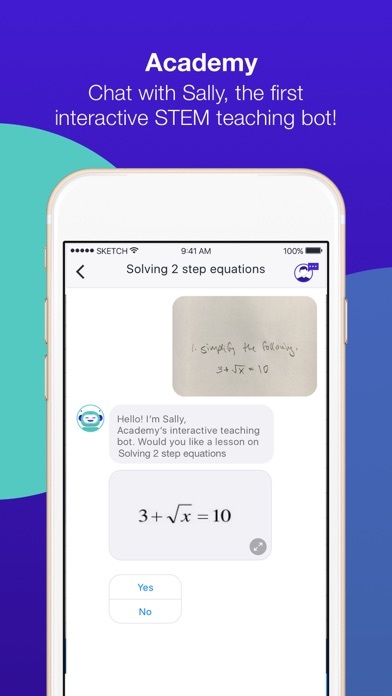 Lessons are taught by Sally, the world’s first interactive STEM teaching bot! 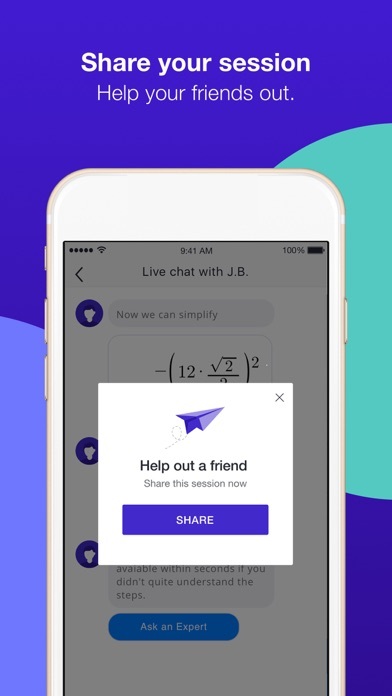 Lessons are through a chat session instead of video, so they instantly load, are interactive, and use practically no data! If something is not clear at any point in the lesson, you can ask Sally for a more detailed explanation and let it know when you are ready to continue! Please take a moment to rate and review, we greatly appreciate your support! Alarm Clock for Me – Wake Up!